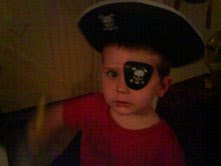 My youngest, being related to me and, therefore, somewhat crazy, sent me this picture of my grandson for "Talk Like a Pirate Day." If I get a picture of him wearing or carrying a towel with him in May, I'll know for certain she's the best darn mother on the planet!! For those of you wondering what has become of me. I'll write soon, Lord willing, thanks for checking on me. Work is good for paychecks but so gets in the way of stuff you'd rather be doing. Omigosh!! There I was, enjoying a bit of Ro....I miss you....and all of a sudden there he was!!!!! For just a moment there, I thought you'd put an old picture of Lindsay on there!!! He is adorable! ARRGH, Matey! !